The researchers found that there were 77 waitlist deaths, with 85 and 57 percent one- and four-year survival, respectively. 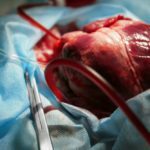 HealthDay News — For patients with advanced heart failure who are listed for transplantation, mortality risk is related to adverse events and end-organ dysfunction that vary over time, according to a study published in the Aug. 7 issue of the Journal of the American College of Cardiology. Eugene H. Blackstone, M.D., from the Cleveland Clinic, and colleagues developed a decision aid that aggregates adverse events and measures of end-organ function into a continuously updated waitlist mortality estimate. A total of 414 patients were listed for heart transplantation from 2008 to 2013; pre-listing patient characteristics and events and laboratory results during listing were analyzed. The researchers found that there were 77 waitlist deaths, with 85 and 57 percent one- and four-year survival, respectively. Pre-listing patient characteristics became non-significant when time-varying events and measurements were incorporated into a mortality model. Neurological events, new requirement for dialysis, and more respiratory complications (hazard ratios, 13.5, 3.67, 1.79, respectively, per episode), as well as higher serum bilirubin and creatinine, resulted in continuously updated estimates of patient-specific mortality throughout the waitlist period. “A continuously updated mortality estimate, combined with clinical evaluation, may inform status changes that could reduce mortality on the heart transplant waiting list,” the authors write.